If you’re faced with the need to move, you may be overly anxious about it. Having to pack up all of your belongings can be challenging. The best way to handle this situation is by hiring professional movers. AT All Around Moving & Storage, we understand that our customers are the backbone of our business and why we have been successful since 1984. This is the reason we go above and beyond to make your next relocation one of the easiest ones ever. We assist with residential and commercial moves. We are prepared to help you with a local, long-distance or even an international move. Change can be a good, but scary thing. It’s probably foremost on your mind to know a little bit about the place you are moving. You can expect a population of 55,224 in this large city according to the 2010 United States Census report. You are sure to find plenty of activities to keep you busy while living in this area. If you love shopping and finding the latest styles, you will want to visit Twelve Oaks Mall which is an upscale mall. If having fun outdoors is more your idea of staying entertained, you’ll want to visit Paradise Park for a day of fun. You can relax in a gazebo or take a spin on bumper cars for the excitement of the day! 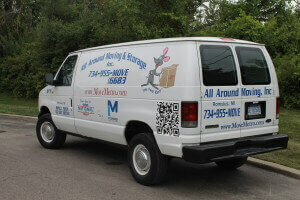 At All Around Moving & Storage, we can help get you where you need to go. Simply give us a call today at 734 941-2280 and schedule a time for your next move!